PrimeFaces provides <p:editor> component which is used to create an editor in JSF application. We can use this editor to get user input in large amount. This editor provides editing and formating tools that we can use to format our input. We can also use it to send formated email. It includes rich attributes that are tabled below. required null Boolean It is used to mark component as required. validator null Method Expr It is a method expression that refers to a method validationg the input. height null Integer It is used to set height of the editor. width null Integer It is used to set widthit of the editor. disabled false Boolean It is used to disable editor. style null String It is used to set inline CSS of the editor container. onchange null String It is used to execute script when editor data changes. maxlength null Integer It is used to set maximum length of the raw input. 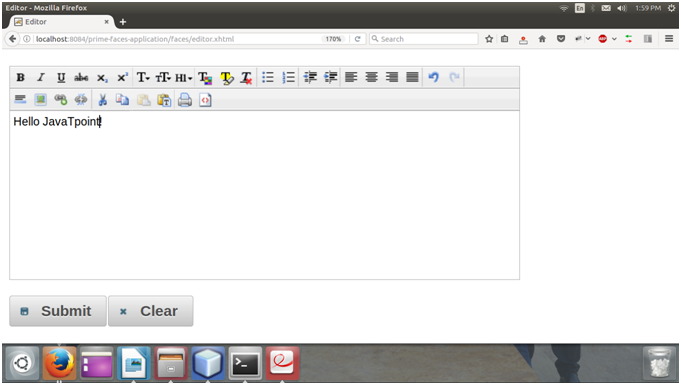 .ui-editor It is used for main container. 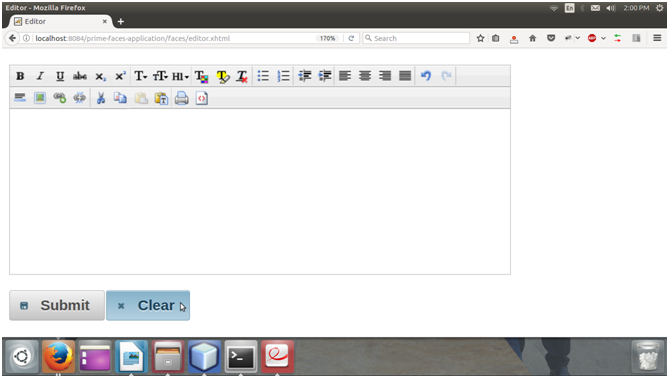 .ui-editor-toolbar It applies on toolbar of editor. .ui-editor-group It applies on button groups. .ui-editor-button It is used for Each button. .ui-editor-divider It is used for divider to separate buttons. .ui-editor-disabled It is used to disable editor controls. .ui-editor-list It applies on dropdown lists. .ui-editor-color It applies on color picker. Here, in the following example, we are implementing <p:editor> component. This example contains the following files.